With rackmount strips down its sides, the Neos can easily be installed in a rack or desk at the desired angle. Analogue summing outside the DAW is a popular mixing technique, often claimed to bring some analogue magic to digital mixes. As always, there's a range of pros and cons to this approach... but I don't propose to debate those here and now! For those who are interested in external or 'OTB' summing, there are numerous solutions available, across a wide range of prices. At the bottom end of the scale are products like the delightfully basic and simple DAV and Roll Music 'Folcrom' passive mixers, which enjoy an inherently unlimited headroom, and the required 'make-up gain' can be provided with different preamps, to lend your choice of sonic character. In the middle ground are simple mixing-desk solutions like the AMS Neve 8816/8804 summing mixer and fader pack, or SSL's X-desk and Panda desk system, along with a variety of rackmounting active summing boxes that use rotary knobs rather than faders. SPL's new Neos summing and monitoring console sits closer to the top of the summing-box price range, edging into the price bracket of serious console territory, where you'll find the Allen & Heath GSR24, Toft ATB24 and TL Audio M4 desks. Each of these products offers different feature sets, of course, but the Neos stands alone with its interesting and, currently, unique selling point, which is that it employs unusually high power rails and discrete circuitry for the primary signal path. SPL first introduced this ±60V power rail and discrete op-amp technology in its custom mastering consoles and, subsequently, in its high-end Phonitor headphone amplifier (reviewed in SOS December 2008). To put the significance of the ±60V supply rails into context, most modern solid-state audio equipment runs off either ±15V or ±18V power rails, while a lot of early classic equipment — including Neve's consoles — ran off single-sided 24V supplies. The greater the supply voltage, the more headroom available, so the primary benefit of SPL's '120V' approach is that it potentially provides 12dB more internal headroom than a typical ±15V system, and 10dB more than a ±18V one. However, the advantages go wider than that, because only discrete component bespoke op-amp circuitry can operate on these higher power rails, and that brings with it impressively low harmonic and transient distortion figures, a 200kHz bandwidth and particularly fast slew rates. All of the Neos I/O employs active electronics — there are no transformers in the signal path to introduce distortion or phase shifts, or limit the bandwidth. The down side of this approach is that it uses slightly more expensive components and more complicated construction techniques, which results in a significantly higher price… but we are talking here about the pinnacles of audio excellence, where the law of diminishing returns dominates ruthlessly, and barely audible quality improvements become scarily expensive to achieve. The Neos is, basically, a simple, 12-fader, stereo line mixer, with a basic monitoring section. All of the input channels are nominally stereo, so the Neos can handle up to 24 channels as 12 stereo stems, although individual fader strips can be switched to summed mono if preferred. The control surface is beautifully machined from solid aluminium, and each of the 12 input strips is equipped with four illuminated push-buttons, a pan/balance knob, and a long-throw fader. The first button (Mono) combines both inputs, the pan pot then allowing the summed mono signal to be positioned in the stereo image with a gain range from +8dB at one extreme to fully off at the other, for each side. The second button (Cut) mutes the channel, while the third (Listen) routes the channel signal directly to the monitor section. Pressing the Cut and Listen buttons together allows a channel input to be auditioned via the monitors without it contributing to the record mix path. The last button (Solo) provides a mono PFL facility. Since the Listen and PFL signal paths are only for checking the audio, they are constructed using conventional op-amps running on conventional power rails, and so have less headroom than the main mix and monitor path, although I doubt that will present anyone with difficulties in practice. 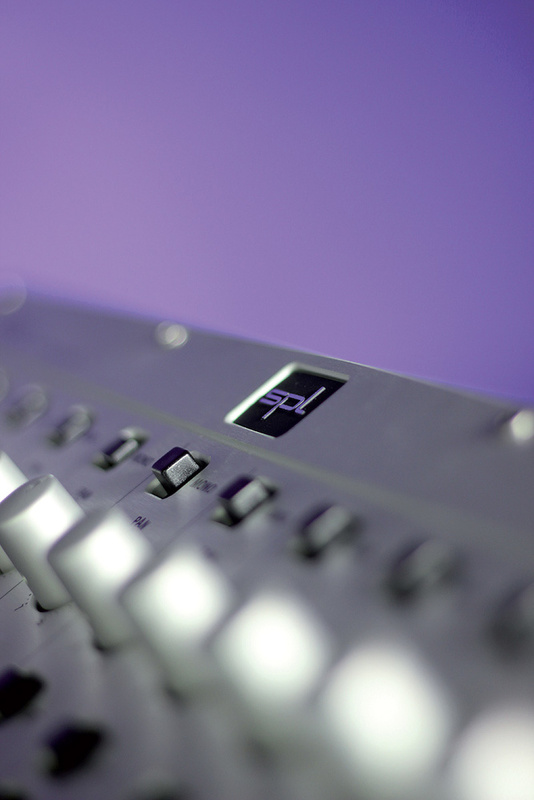 Under a scribble space, a pair of LEDs indicate the presence of input signals on each channel (illuminating at -10dBu), while the 100mm RS-K 'professional' series Alps fader is scaled with 6dB of gain in hand above the unity mark. At this price level, one might have assumed that P&G faders would have been de rigueur, but these Alps models — built specifically for SPL — have a very good reputation, and certainly feel nice to use. The fader spacing is also good, with the adjacent fader caps falling nicely under the fingers. Over on the right-hand side of the operating surface is the stereo mix master fader — identified with a bright red knob against the black fader knobs of the input channels — while above are the master and monitor section controls. The master fader has a slightly different gain structure to the channel faders, operating with an 8dB gain margin instead of 6dB. The master section also has two more push buttons associated with it, one labelled Bend and the other Master Insert. The role of the latter is probably obvious, introducing a dedicated relay-switched send-return loop breaking into the signal path between the stereo-bus mix amp and the master fader. Separate XLRs are provided for the sends and returns, although these are wired unbalanced (even though one of the manual diagrams suggests they are balanced!). It seems a very odd decision, given that any likely bus compressor used in the insert will have a balanced I/O. The technology is clearly available, since the record output and monitor tape return have balanced high-voltage drivers and receivers. SPL explained that circuit-board space and power-consumption concerns made balanced interfaces impractical and, because any inserted processor was likely to be placed alongside the Neos, the interference rejection properties of balanced connections are irrelevant, and unbalanced connections involve fewer electronics, and so give a better sound. Although the primary benefit of the high-voltage audio circuitry employed in the Neos is that it allows an extremely transparent signal path, often that's not actually what is required when mixing! A little bit of musically complementary 'saturation' with some odd-harmonic distortion can often work wonders — and that's what the Bend button is all about. When it's activated, a multi-stage, passive compression circuit (constructed from germanium and silicon diodes) helps to smooth out the transient peaks in a gently progressive way, starting with some very subtle saturation for signals just below 0dBu, building into a mild 1.3:1 compression effect above about +5dBu (see plot), with increasing odd-harmonic distortion. The desk outputs start to limit and then clip above +24dBu. There are few bells and whistles on each channel strip: the emphasis is on high-quality simplicity.The output from the master fader is routed to buffered but unbalanced XLR outputs intended for an external level-meter system, there being no output metering in the Neos, and also feeds a balanced line driver for the dedicated record outputs, also on XLRs. This balanced signal is also routed via a relay to the balanced input of the monitoring, with the relay switching between the balanced DAW/tape-return signals instead of the main stereo output, and controlled by the Tape/Mix button located immediately above the Master Insert button. The monitor section also employs high-voltage electronics to maintain the transparent signal path right through to the speakers. An unbalanced 'Alternate' XLR output is fed directly from the monitor section's input receiver, so relays the monitor source selection (desk or tape return) and is intended to drive an external headphone amplifier — there being none in the Neos — or a second record destination (allowing dub transfers between primary and secondary machines), or even a metering system. The monitoring section signal path continues with another relay that switches automatically between the main monitoring signal and the Solo (PFL) signal whenever an input channel is solo'd. The output from this relay is mixed with signals routed via the channel Listen path. Three more push-buttons select Mono, 20dB Dim and Mute functions, and a slightly larger knob than used on the pan-pot adjusts the monitoring level. This is calibrated with 7dB of gain in hand (the volume control is another Alps potentiometer, in this case the 'big blue' RK27 model). The final push-button, labelled Mon B, above the volume control switches the monitoring signal between the A and B speaker outputs, to cater for main and nearfield monitors. The rear panel of the Neos is nicely laid out, with plenty of space between the connectors, most of which are XLRs, and SPL's customary and very thoughtful dual labelling: normal and upside down, making it easy to read the labels when peering over the top of the desk from the front!. The 24 channel inputs, which can accommodate signals up to +30dBu and present a 10kΩ input impedance, are hooked up via three 25-pin D-subs wired to the usual Tascam balanced analogue arrangement. Almost all of the other inputs and outputs are via XLRs, in a mix of balanced and unbalanced, as described earlier, but a pair of five-pin XLRs are provided to share the recording and monitoring buses with a second Neos desk as a cascade slave. A huge 14-pin power connector transfers the rail voltages from a very chunky external linear power-supply unit measuring 154 x 67 x 236 mm. A small push-button on the rear panel provides a ground-lift facility to separate the audio and chassis earths, and a second ground-lift switch is fitted to the power-supply module. The mains on-off button, 115/230V selector and fuse are all located on the power-supply unit, which connects to the mains supply via the usual IEC inlet. The ubiquitous blue LED is placed above the master section of the console to indicate when it is powered. The Neos occupies a hefty 7U of 19-inch rack space, but the rack ears can be positioned in one of two ways to allow installation with the control surface horizontal or raked at a comfortable 10 degrees. It's quite a heavy beast to move around too, weighing 14.1kg, or about 32lbs, with the external power supply adding another 3kg, or 7lbs. 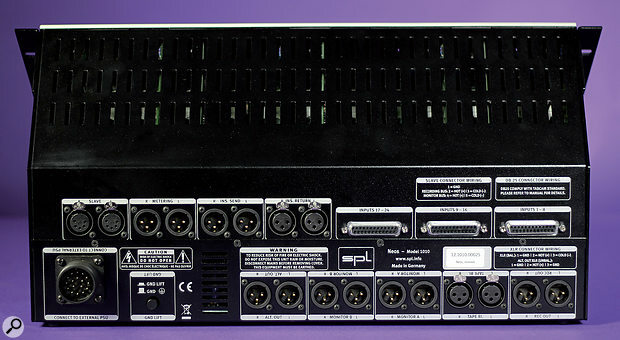 Most connections are presented as XLRs, although the 24 channel inputs are on DB25 D-sub connectors. Some thought is required when connecting the Neos if you want to work with a combination of mono and stereo channels on mixdown. I played around remixing some multitrack material and ended up using complicated DAW output routing to put the kick and snare drums on outputs 1 and 3, with stereo drums on 5 and 6, and bass on 7, occupying the first eight-way D-sub input into the console. The first two and fourth Neos channels were switched to mono, of course, but care is needed because anything left on the DAW converter outputs for channels 2, 4 and 8 would be mixed with those on 1, 3 and 7. As this approach inherently brings a small (practically insignificant) noise penalty, I'm surprised the channel mono switch doesn't disable the right-hand input completely. The second cable handled stems for stereo backline, stereo lead instruments, stereo backing vocals, and mono lead vocal on output 15, with the third carrying stereo delay effects and two stereo reverb returns, leaving one fader spare. I also routed the DAW's stereo mix output bus to channels 25 and 26 and patched those individually to the Neos' DAW/tape return inputs, so that I could monitor the final mix replayed from the DAW. I normally track and mix with generous headroom margins (10dB or more), and when working with analogue outboard I find this translates to a sensible analogue operating level and everything sounds as it should. However, a lot of people still track and mix with negligible digital headroom, and when these very hot signals are routed from the D-A converters (typically peaking around +22dBu or higher) into most analogue equipment, the very high average levels and lack of headroom often manifests as an unpleasantly harsh and strained sound. This is because the electronics are working much closer to their power rail limits than the designers anticipated, with a deleterious effect on sound quality. Passive summing mixers aren't bothered by such high levels, of course, but neither is the Neos, thanks to its very generous internal headroom margins. This fact alone will endear the Neos to the 'if it ain't making the red lights flash to the rhythm it ain't loud enough' contingent! The overriding impression when mixing with the Neos is that there is nothing in the signal path! It really is that transparent and neutral, with beautifully fast, precise transients, a wide-open sound at both frequency extremes, and no innate sound character under normal working conditions. This is one of the cleanest analogue mixing consoles I've ever heard, and the controls feel smooth and reliable under the fingers. However, I was disturbed to find around 0.7dB of level difference between left and right channels, which was consistent with all input channel and output connections, and remained stable with normal fader settings. The implication is a mix-amp gain error, which I expect is tweakable, but I'm surprised it left the factory with such an obvious misalignment. Pressing the Bend button endows the Neos with a slightly thicker sound character, which makes the mix a little more organic, but it only becomes obvious if you deliberately push the mix levels quite hard. With normal mix levels, the effect is of benignly tamed transients, but it gradually builds into a more overt form of gentle mix compression, gelling things together in a helpful and musical way, with some nice harmonic richness. I've often found that mixing in the analogue domain is easier and somehow less critical than in-the-box mixing, and the Neos is no exception. Mixing on its control surface was a very pleasant experience. The monitor section does what it says on the tin, but despite SPL's claims of being 'comprehensive', it is actually pretty basic. You can check the mono sum, and dim or mute the monitoring level, but as there is only one external input (which would normally be carrying the DAW mix replay), it is impossible to compare directly the mix in progress with a reference CD, for example, and that was a major frustration for me. There are many things to love about the Neos — not least its impressively transparent sound quality and beautiful construction — but there are also some quite perplexing aspects. While probably not an issue in a well-grounded studio installation, the use of unbalanced connections for the insert sends and returns and the alternate outputs seems miserly and counter-productive. The lack of a second monitor input also reduces the practicality in a frustrating way, and I can see the channel mono summing causing some confusion. The channel gain disparity is very surprising and not to SPL's usual high standards — so I'll put that down to an early production model gremlin. On the plus side, the inclusion of dedicated mix-bus metering outputs is useful, the Bend feature is inspired, and the overall technical and sonic performance is utterly brilliant. The Neos also happens to be magnificently constructed and is a genuine joy to use — and even just to look at! Although there are competing consoles and high-end summing boxes (as discussed in the main text), none boast the headroom of the Neos, and few provide tonal options to rival those afforded by the Neos' Blend function. An individual channel module, revealing the discrete transistor circuitry. During the course of this review, I took a number of measurements using an Audio Precision Analyser, and we've made the resulting test plots available on the SOS web site at /sos/aug12/articles/splneosmedia.htm. The headline facts and figures, though, are given here. The Neos has a frequency response claimed to extend between 5Hz and 200kHz (-3dB points), with little phase shift through the audio band (+5 degrees at 10Hz, -4.5 degrees at 10kHz and -8.5 degrees at 20kHz). The total harmonic distortion figures are very impressive, at below 0.003 percent for all frequencies and a 20dBu signal level. The A-weighted signal-to-noise ratio with all channels faded up to unity (relative to a +20dBu input signal) measured 110dB, and 94dB relative to a nominal +4dBu signal level. Power consumption is around 75W. The internal construction is impressively old-school, with each channel strip built independently and with its own circuit card suspended vertically from separate metal frames, which are hidden beneath the milled aluminium top plate. Each module plugs into a motherboard running horizontally across the base of the chassis. The majority of the audio circuitry is built with discrete transistors arranged in closely mounted pairs, with each module having its own local voltage regulation. The Listen and PFL signal paths are constructed using conventional op-amps. 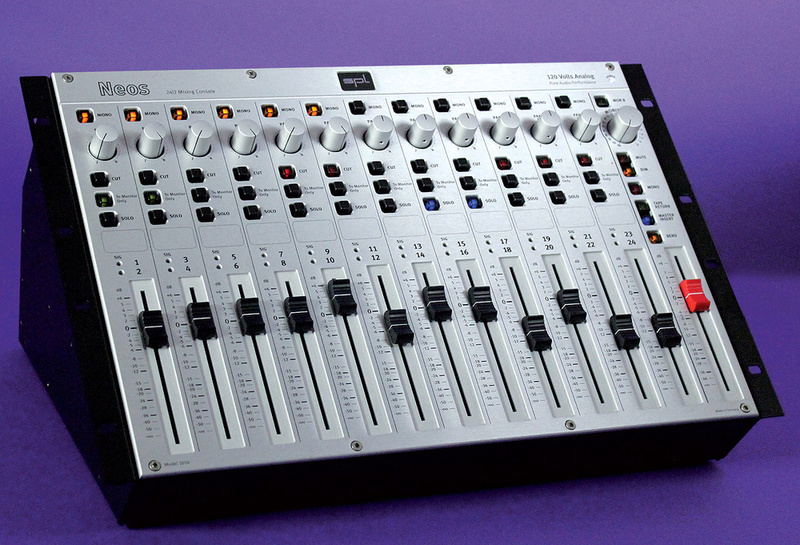 Twelve faders individually configurable for mono or stereo sources. Unbalanced insert sends/returns and Alt outputs. Only one external input to the monitoring. Channel mono sums both inputs. Channel gain mismatch on review model. The Neos is an analogue summing mixer with rather basic facilities but phenomenal sound quality and technical specifications, thanks mainly to its use of ±60V power rails and discrete circuitry. Hand In Hand Distribution+44 (0)1752 696633.